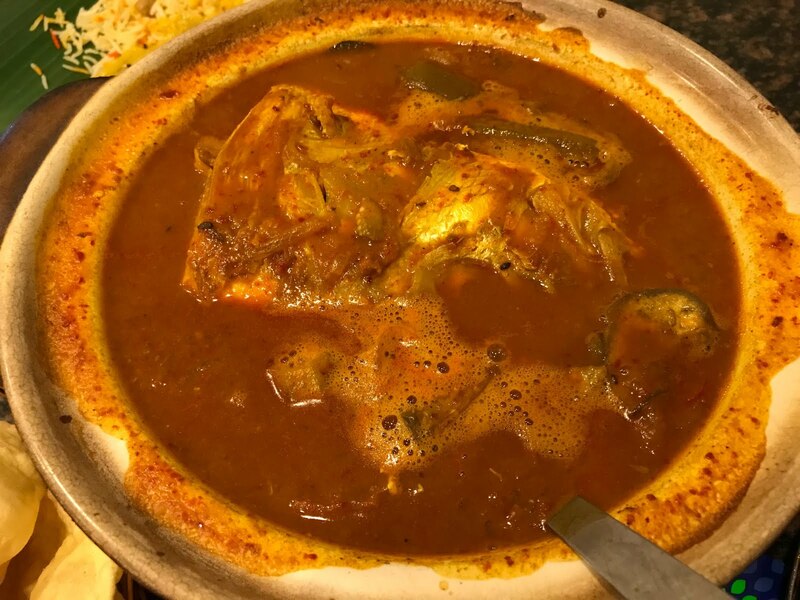 The fish head curry arrived bubbling at our table! Hot and delicious! When in Singapore, local friends ask, where are you eating?! It's serious business that needs to be sorted. One of my first meals? Fish head curry. I fondly remember back in 1999 coming to Singapore on business and my colleagues took us to a back street eatery where they served this giant fish head sitting in a platter of curry sauce with okra and eggplant. It was mildly spicy and the fish head had so much meat we were stuffed. I hadn't had it since and so one of my good friends took me to a place called Samy's Curry Restaurant on Dempsey Road. 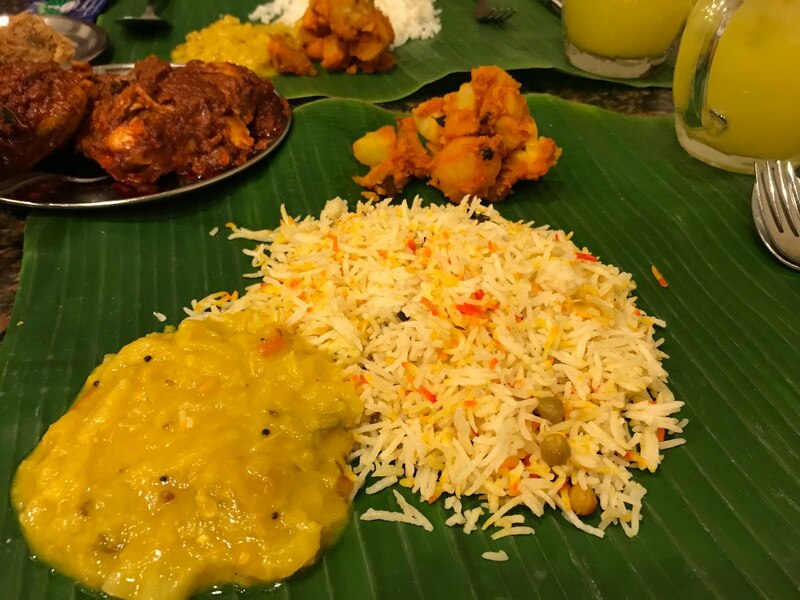 It was started by M Veerasamy, a chef from southern India who originally came to Singapore to cook for a group of Indian merchants who traveled to Singapore for trading. He opened his first outlet in the 1960s and then moved it to two other locations before finally settling on where it is today. Diners either sit under fans, or further inside where there is air conditioning and we opted for the latter. Perhaps because there were only three of us we ordered a small fish head curry, along with masala chicken and lime juice. We didn't have plates -- the servers gave us cut up banana leaves as our plates and promptly put a scoop of biryani rice (or white rice), along with some potatoes in a very mild red curry sauce, and another in a yellow sauce. The fish head came bubbling in a clay pot and it doesn't look too appetizing, but it was delicious. The meat from the snapper was perfectly cooked, so it was firm and not flaky, the curry sauce was so flavourful, full of herbs and spices. Dig further underneath and there was also okra and Thai eggplants. Meanwhile the masala chicken was spicier, and also delicious, but I preferred the full flavours of the fish head curry washed down with lime juice -- and all that rice! 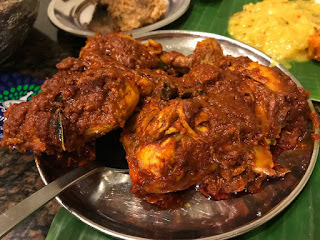 Many locals specifically come to Samy's Curry, preferring it to Muthu's Curry in Little India, which was just giving the Bib Gourmand by the Michelin guide two days ago. Loyal Samy's diners say it should get the Michelin nod, but the current owner doesn't care. He's busy as it is and happy to have his regular customers.